Fr Graziano de Palma was born on the 31st July 1976 in Molfetta, a small town near Bari, one of the main cities of Puglia in southern Italy, on the Adriatic Coast. After high school, he moved in 1996 to Rome where he attended the Seminary of Missionaries of Precious Blood and started his priestly formation, studying with the Jesuits at the Pontifical Gregorian University. In 1998 he completed his studies in Philosophy, and in 2001 his studies in Theology. He moved back to the south of Italy for his pastoral experience in Putignano near Bari. There he worked for 5 years serving in a therapeutic community helping drug addicts. In 2004 he was ordained Deacon and then Priest in 2006. Fr Graziano was then engaged in many different apostolates, mainly with youth as Spiritual Assistant of AGESCI, the Catholic association of Italian scouting. Fr Graziano was assistant priest in two communities, in Sicily and Bari where he was also a teacher of religion in a private junior school. In March 2015 he arrived at Saint Peter’s, as a student of English. In March 2016 he completed his Degree in Psychology at the University of Bari and is now studying for a master’s degree in counselling, in London. 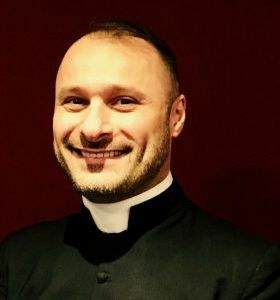 Fr Graziano serves as assistant priest at St Peter’s, Chaplain at St Peter’s Primary School, Woolwich, and Foundation Governor at Notre Dame Primary School, Shooters Hill.